Generally speaking, I am rather indifferent to cars. And I couldn't care less about people who judge you by the car you drive. So, why was I drooling in front of a bunch of bright and sparkling automobiles the other day? No, I was not shopping for a new car – though my old one is slowly falling apart. I drove my sneezing and coughing Toyota all the way to Oxnard to have a look at Mullin Automotive Museum, which opened only three years ago. Do you recall the famous scene from Breakfast at Tiffany's where Audrey Hepburn stands salivating at the jewelry in the window display? That's exactly how I felt upon entering this museum's sprawling display of the most beautifully designed, elegant, and seductive cars I have ever seen in my life. Does the word Bugatti mean anything to you? If it does, just imagine dozens of these exquisite, magnificent French automobiles displayed alongside other luxury cars –most of them designed in the 20s and 30s. All cars have been restored to perfection, and they can be driven on the spur of the moment. The one lucky person who has the pleasure of racing these beauties is Peter Mullin, the automobile collector and founder of this private museum. Walking through the museum with Mr. Mullin as my guide was a very special experience indeed. His knowledge and love for all his curvaceous, cool, metallic beauties is simply contagious; it made me think of art museum curators sharing scholarly insights on their precious masterpieces. In my humble opinion, most of today's luxury cars, compared to those I saw on display at Mullin's museum, look like country bumpkins. There are only a hundred miles between Oxnard and Laguna Beach, but the small, earthy objects I found at Laguna Art Museum –with their richly textured surfaces –were a world apart from the cool, sleek cars at Oxnard. LA artist Adam Silverman is well known for the earthy beauty of his ceramic vessels –many of them looking as if they were discovered by archaeologists digging through ancient settlements. Entering Silverman's Clay and Space exhibition is like stepping onto a theater stage, with each gallery being yet another act in a dramatic play. And Adam Silverman is not only the leading actor, but also the playwright and set designer of this theater production/museum exhibition. The first gallery, with its dark walls and dramatic spotlights, introduces the visitor to a variety of modestly scaled vessels. The second one allows you to step into a circular enclosure made out of bricks and burnt wood, which gives you the sensation of being inside of a large kiln. Many of the pots on display there were made out of materials that the artist found in Laguna, and he actually fired these pots right on the beach. The gallery, at the very back of the exhibition, has a single small round sculpture with a video projected onto it, thus transforming the humble ceramic object into a planet traveling through Outer Space. The exhibition ends with videos of the famous Capela de Ronchamp by Le Corbusier, showing the interior and exterior of the chapel, which rises out of the grounds of eastern France like an exotic, suggestive flower. It's not that often that an artist would pay such a thoughtful and eloquent tribute to the great Master whose art inspires him. Adam Silverman's exhibition runs through January 19, 2014 and coincides with the publication by Skira Rizzoli's book on Silverman's work, titled Adam Silverman Ceramics. 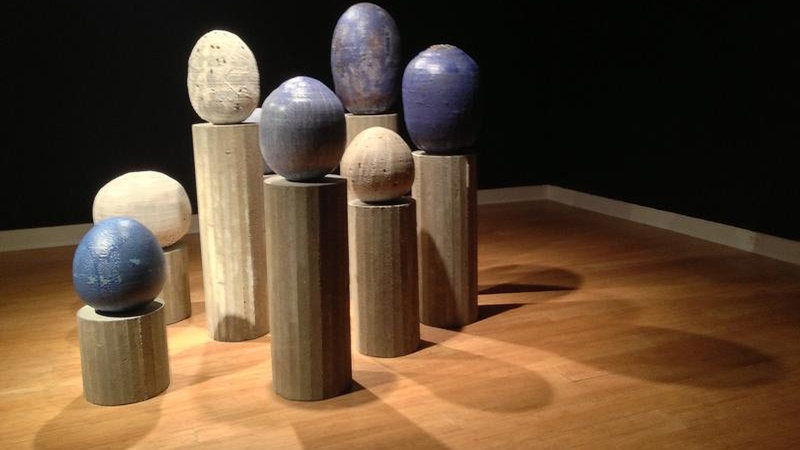 Banner image: Adam Silverman' Clay and Space installation at Laguna Art Museum. All photos by Edward Goldman unless otherwise noted.